Do you already have your answers to "What do you want for Christmas?" locked and loaded? If you don't, let me help you out. ;) Ev.Ry.Single.Woman. needs a classic leather jacket in her life. They truly never go out of style! If your family is anything like mine, they get really excited when I pick only one, nicer option for my Christmas list instead of my usual list of "oh some sunglasses, a few shirts, a book, a coffee cup, etc. etc." I suggest investing in one of good quality as it is something you will have forever. The one I'm wearing is actually from Wilson's Leather from a couple of years ago, but I've linked some similar, great options here, here, and here. If you want a faux leather one at a lower price point, this one is a great option. 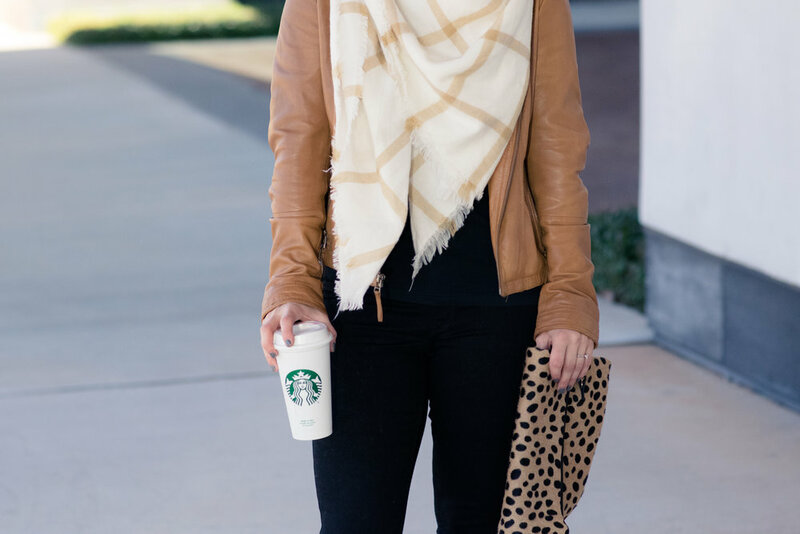 Now, let's talk about blanket scarves for a second-another must have on your Christmas list! The first time I ever received one I had no idea what I was doing with it, haha! It was huge and bulky and seemed hard to manage. Thank God for Pinterest and all their tutorials! If you fold it in half and then put the opposite ends together so it makes a diamond shape, you can wrap both ends around your neck and have an adorable and SUPER WARM accessory to make any basic outfit more exciting! I have linked several of my favorite blanket scarves here, here, here and here.